Orchardgrass, red clover, and white clover growth 71 days after late-summer seeding. Seeding rates: 10, 8, 4 lb/ac, respectively. Orchardgrass, red clover, white clover, and Italian ryegrass growth 71 days after late-summer seeding. Seeding rates: 10, 8, 4, 6 lb/ac, respectively. Challenges associated with establishment-year grass/legume seedings include low forage yield, high weed yield, and soil erosion. To address these problems, farmers sometimes include a more rapidly-establishing ‘companion’ crop in the seeding mixture. Common species include oats, peas, barley, spring triticale, or some combination thereof. While these species can work very well, the seed is relatively expensive and is best planted through the large grain box of a drill. 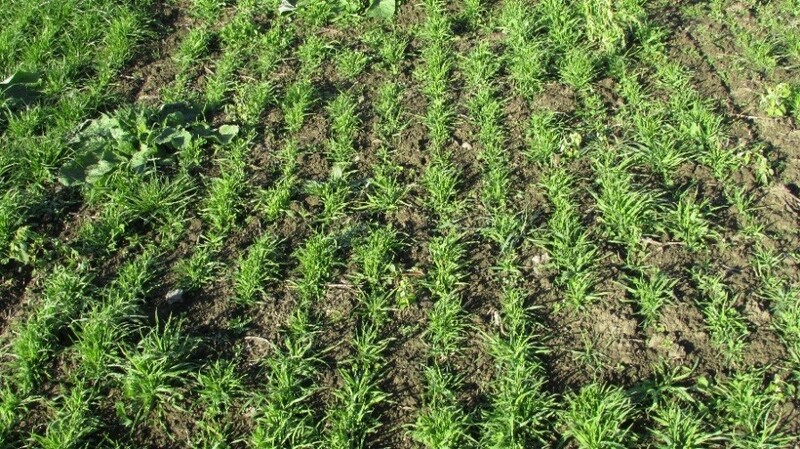 Italian ryegrass (IRG) is increasingly being used as a companion crop because it can produce higher yields of forage with quality superior to that of oats, the seed is much less expensive, seeding rates are low, and it can easily be metered through the small-seed box with perennial grasses and legumes. Its dense, fibrous root system is also well-suited for soil stabilization and improving soil quality. Another characteristic of IRG is that it establishes much more rapidly than most forage species. Virginia Tech researchers demonstrated that IRG accumulated three times more dry matter than alfalfa and nearly five times more dry-matter than orchardgrass in the first 30 days. At 51 days, IRG had accumulated 5.6 and 5.3 times more DM than alfalfa and orchardgrass, respectively. Depending on the circumstances and management, this characteristic vigor can be very helpful (yield) or provide excessive competition. Potato farmers in Northern Maine often have barley in their crop rotation. Increasingly, when they plant barley they are interseeding it with IRG. Because true IRG does not produce a seedhead in the first year, it does not interfere with barley harvest. After the barley has been harvested, the prolific roots of the IRG scavenge nutrients and add carbon to the soil until it is plowed in the fall. Because highly disturbed soils tend to lose soil organic matter, interseeding IRG in the barley crop is a sensible way to attempt to preserve soil quality. In an effort to boost yields and improve weed control in perennial forages, an often catastrophic mistake is using an excessive rate of IRG seed as a companion to the perennial species in the seed mixture. Doing so can result in a high yield of IRG forage in the first year and reduced yields from the perennial species thereafter. Recommendations from University of Wisconsin indicate that IRG seed should not be included at more than 2-4 lb/ac when being used as a companion crop. When grown as a companion crop, some IRG varieties suppressed alfalfa growth more than others. Excessive shading from IRG or frequent harvest in the first year could be hard on perennial seedlings. In areas with adequate rainfall the ryegrass was more competitive with the alfalfa. Some IRG varieties grown as companion crops yielded more forage DM than an oat companion crop. An IRG companion crop in a perennial forage seeding can increase yields by 1.5 tons/ac compared to perennial forages grown without a companion crop. Treatments with the IRG companion crop had between 0.4 and 1.6 tons/acre less weed biomass than the control that was planted to alfalfa alone. In addition to adding tonnage to a first-year seeding of perennial forages, Italian ryegrass protein levels are high, fiber levels are low and 30-hr neutral detergent fiber digestibility (NDFd) is extraordinarily high. 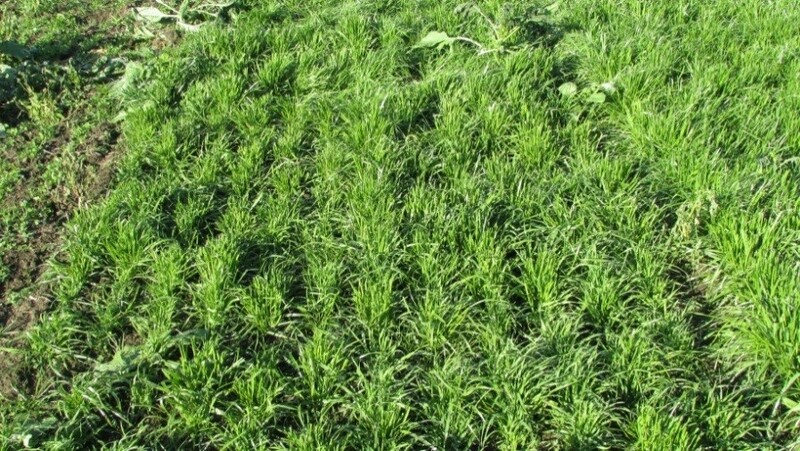 For more information on growing Italian ryegrass as a forage crop, please see Italian Ryegrass as a Forage Crop. Second year Italian ryegrass — significant but not complete winter-kill. 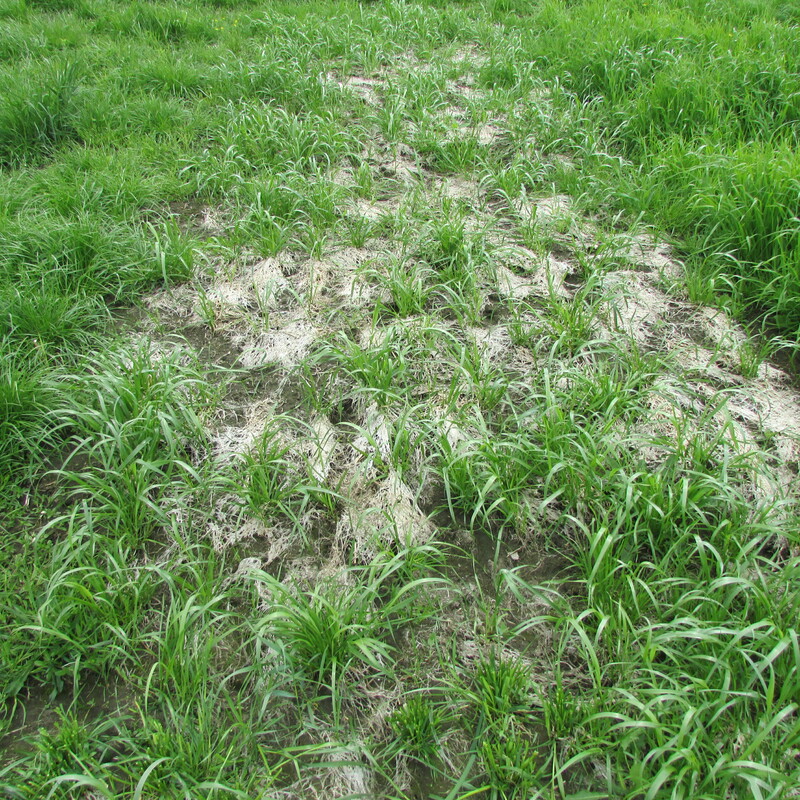 are mild and/or snow cover is substantial, winter survival of Italian ryegrass will be spotty at best. Continued advances in plant breeding may result in varieties of Italian ryegrass that are winter-hardy enough to consistently allow the plants survive the first winter and subsequently complete their biennial lifecycle. 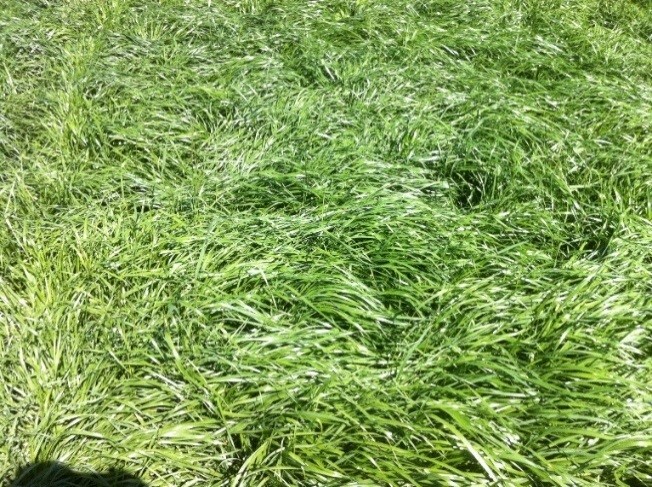 Italian ryegrass planted after corn silage will not grow appreciably before winter. If it survives, it will be very slow to rebound in the spring and will provide negligible cover crop service. Future work on cover cropping systems will determine how/when it can be used as an in-season cover crop in corn silage and vegetable production systems. Companion crop management tip: When using a companion crop of any species, variety, or combination, special attention must be given to the basic needs of perennial seedlings in the understory in order to avoid needing to replant. Both light and water competition from the companion crop can put the perennial species at risk. Excessive and/or prolonged shading of the perennial forage seedlings results in etiolation (few leaves, tall/spindly growth, and a yellow color). Etiolated seedlings are less thrifty, more prone to lodging, and more vulnerable to damage from hoof and tire traffic. Given the high cost of replanting a failed perennial stand, if light competition seems to be approaching a critical threshold at a time that is not convenient for harvesting the companion crop, it is often better to clip the top-growth just above the developing perennial seedlings (tedding it to spread out the residue) rather than wait for harvest. The value of this small yield loss is much lower than the cost of reseeding a stand that failed as a result of excessive light competition from the companion crop. This entry was posted in Uncategorized and tagged companion crop, competition, grazing, Italian ryegrass, nurse crop, oats, pasture, peas, perennial ryegrass, rotational grazing, seeding down, seeding rate, spring triticale, weeds, yield. Bookmark the permalink.